A survey question is used to get information from your user while they’re interacting with your content. They’re not used to customize guides like the questions that you embed in the guide while authoring. 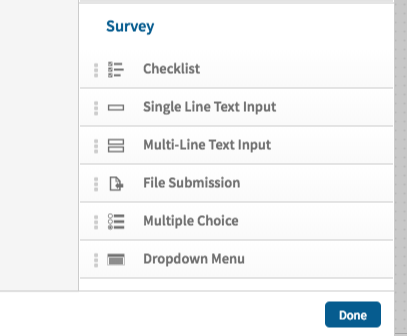 Survey questions are broken down into the following types: checklists, single line input, file input, multi-line input, multiple choice, dropdown menu, PDF Form Field.